Before a final remedy was selected, the Department of Toxic Substances Control (DTSC)The department within the California Environmental Protection Agency in charge of the regulation of hazardous waste from generation to final disposal. DTSC oversees the investigation and cleanup of hazardous waste sites. evaluated the potential environmental impacts of the remedial alternatives and the proposed remedy in a Certified Environmental Impact Report (EIR)A report designed to examine the potential environmental impacts of proposed activities. in 2011 pursuant to the California Environmental Quality Act (CEQA)A law mandating review of environmental impact of governmental action. It requires that public agencies study the significant environmental effects of proposed activities and that the public be informed and allowed to comment on project decisions.. For more details, see the CEQA page of this website. In addition to the EIR, DTSC also prepared a Statement of BasisA document which describes the basis for DTSC's proposed remedy and cleanup standards. that concurred with the Pacific Gas and Electric Company’s (PG&E) recommended alternative as the preferred remedy and explained the rationale for the selection. The public and other government bodies were provided a 45-day review and comment period on the Draft Statement of Basis and the Draft EIR. Responses to comments received during the Draft EIR public notice period are incorporated in the Final EIR, which included the Final Statement of Basis as Appendix C. DTSC adopted the proposed remedy in the Final EIR on January 31, 2011. 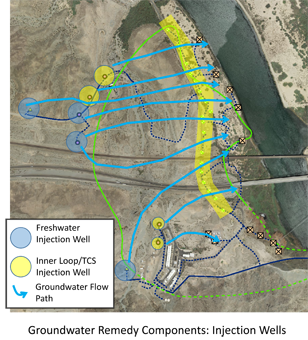 In May 2015, DTSC determined that the preparation of a Subsequent EIR was required to evaluate potential environmental impacts resulting from design details of the selected groundwater remedy (In situ TreatmentTreatment of contamination in place. with Freshwater FlushingMoving of fresh water through the well system to push the plume through an In-Situ Reduction Zone located along National Trails Highway.) that were modified since the approval of the conceptual Groundwater Remediation Project in the 2011 Final Groundwater Remedy EIR and the 2013 Addendum to the EIR. DTSC issued a Notice of Preparation announcing this decision. The public comment period for the Notice of Preparation began on May 5 and ended on June 4, 2015. Two scoping meetings for the preparation of the SEIR were held in May 2015. Comments received were incorporated into the draft Subsequent EIR. On January 12, 2017, DTSC posted a notice to the public of the availability of the draft SEIR, a 47-day public comment period, and two open house/public hearings on the Draft SEIR. Comments received during the January 12, 2017 through February 27, 2017 comment period were responded to and incorporated into the Final Subsequent EIR for the Groundwater Remedy, which was certified on April 24, 2018. The U.S. Department of the Interior (DOI)The United States department charged with conservation and development of natural resources. The U.S. Department of the Interior uses sound science to manage and sustain America’s lands, water, wildlife, and energy resources, honors our nation’s responsibilities to tribal nations, and advocates for America’s island communities. underwent a parallel process. DOI prepared a Proposed Plan that identified the preferred alternative selected by DOI and explained the rationale for the selection. The public and other government bodies were provided an opportunity to review the Proposed PlanA plan for a site cleanup that is available to the public for comment. and to provide comments during the same 45-day comment period as DTSC. DOI prepared responses to the comments received in the DOI groundwaterWater beneath the Earth’s surface that flows through soil and rock openings (aquifers). Record of Decision, which was finalized in December 2010. PG&E and the DOI executed a Remedial Design/Remedial Action Consent DecreeAn agreement between a lead agency and responsible party in which the responsible party commits to investigate the nature and extent of contamination at and surrounding a site governed by CERCLA, and related remedial actions addressing contamination, and to take corrective action. under the Comprehensive Environmental Response, Compensation, and Liability Act (CERCLA)Commonly known as Superfund, this law created a tax on the chemical and petroleum industries and provided broad federal authority to respond directly to releases or threatened releases of hazardous substances that may endanger public health or the environment. CERCLA established prohibitions and requirements concerning closed and abandoned hazardous waste sites; provided for liability of persons responsible for releases of hazardous waste at these sites; and established a trust fund to provide for cleanup when no responsible party could be identified. The law authorizes two kinds of response actions: short-term removals, where actions may be taken to address releases or threatened releases requiring prompt response; and long-term remedial response actions that permanently and significantly reduce the dangers associated with releases or threats of releases of hazardous substances that are serious, but not immediately life threatening. in 2012, which was lodged with the U.S. District Court for the Central District of California in January 2013, and became effective upon approval by the court in November 2013. The final remedy selected by DTSC and DOI is referred to as the "In situ Treatment with Fresh Water Flushing" for treatment of the contaminant hexavalent chromium in groundwater. Chromium is an abundant element found naturally in the Earth's crust, but hexavalent chromium can be toxic. Trivalent chromium, another form of chromium, is nontoxic. In fact, trivalent chromium is used as an essential nutrient and is added in vitamins. The main contaminant in the groundwater at PG&E is hexavalent chromium, which can be converted to the trivalent form through biochemical adjustments in the subsurface. The proposed groundwater remedy involves pushing the hexavalent chromium groundwater plumeA body of contaminated groundwater. The movement of a groundwater plume can be influenced by such factors as local groundwater flow patterns, the character of the aquifer in which the groundwater is contained, and the density of contaminants., with uncontaminated water, through a treatment area made up of injection and extraction wells also (known as an in situ reactive zone or IRZ). The IRZ treatment area converts the hexavalent chromium contaminated groundwater to trivalent chromium, the nontoxic chromium, by injecting nutrients into the contaminated groundwater to stimulate growth of harmless and helpful, naturally occurring bacteria. The bacteria then change the chemistry of the groundwater causing the hexavalent chromium to convert to trivalent chromium. Because trivalent chromium is not soluble in water, it is removed from the groundwater and becomes part of the soil. After the successful removal of the hexavalent chromium from the groundwater, treatment will stop, and the bacteria level and the geochemical conditions in the groundwater will return to pretreatment conditions. The trivalent chromium is stable, does not revert back to hexavalent chromium, and will continue to be part of the soil. The injection wells inject nutrients, and the extraction wells take water out to add additional nutrients and recirculate to enhance the treatment time and groundwater control. 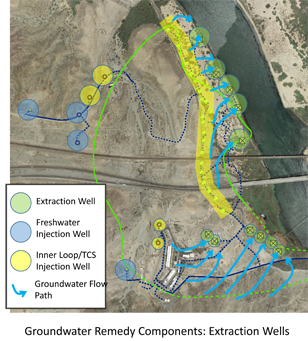 Extraction wells installed near the Colorado River will extract the groundwater and send it to the treatment area to prevent untreated contaminated groundwater from reaching the river. Also, extraction wells will be installed in the southeastern edge of the plume to extract contamination that is present within the bedrock in the East Ravine area. The extracted contaminated water will be treated with nutrients and recirculated to one of the injection wells at the western plume edge to push groundwater movement to the treatment area. See figures below. The remedy consists of five main elements: (1) an IRZ with a line of wells along the length of National Trails Highway where a carbon source, such as ethanol, will be added to stimulate the growth of helpful bacteria; (2) extraction wells near the Colorado River that would extract water, which would then be pumped to the western edge of the plume where additional nutrients would be added; (3) freshwater injection wells to the west and outside of the plume to accelerate groundwater flow towards the IRZ; (4) restrictions on groundwater use; and (5) continued monitoring of the treatment process and the groundwater plume. Supporting infrastructure for this remedy would include roads, pipelines, and utility connections needed to connect the remediation system and provide access to the wells and related remediation facilities. Implementation of the remedy would consist of multiple phases: construction of new facilities (estimated 3-4 years), operations and maintenance of the remediation system (estimated 30 years), continued monitoring after treatment is complete (up to 20 years), and decommissioning of facilities following successful remediation (estimated 1 year). Additional information on the remedy can be found in the December 2009 CMS/FS; the January 31, 2011 Final Groundwater EIR; the 2013 EIR Addendum; the 100% Design; and the 2018 Final Subsequent EIR for the groundwater remedy, which can all be found in the Document Library.